In order to use this feature, users need to install the 0.3.1846 update and WhatsApp Desktop should support this feature in the next upcoming update. Almost 10 days after it was announced that WhatsApp is launching the stable version of the picture-in-picture mode feature for Android. It has now been reported that the feature is making its way to the desktop/web version of the instant messaging app as well. According to WABetainfo, WhatsApp has been working on this update for quite some time. The feature initially had to support more services, but WhatsApp has decided to partially release it for users to test. The Picture in Picture feature is currently available for shared videos and to get this, users need to have the 0.3.1846 update installed. “Every time you open WhatsApp Web, WhatsApp Web automatically checks to see if there is a new update, installing it at the next launch,” WABetainfo said. WhatsApp is said to be testing this feature also for videos hosted on Facebook, Instagram, YouTube and Streamable, but currently it is only enabled it for shared videos. When a video is sent, users can choose to play it in the Picture in the Picture mode. Just like WhatsApp for iOS, a user can continue to message in the chat, and they can also start messaging with other contacts. The PiP won’t disappear. In Android, the feature is a bit different from iOS. If you move to another chat while playing a video in Picture in picture mode on Android, the video disappears. 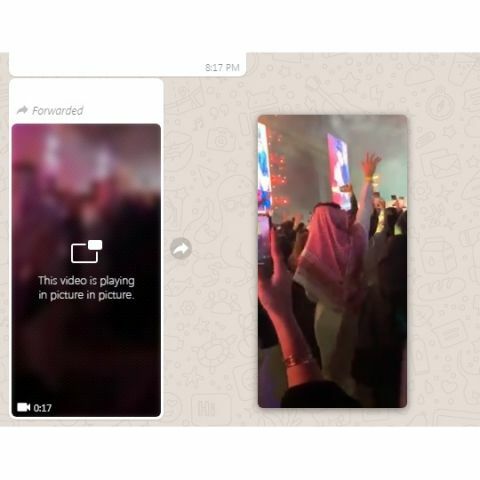 Available for a long time on iOS, WhatsApp only recently introduced Picture-in-picture mode for videos from YouTube, Facebook, Instagram and some select platforms. It allows users to view videos in a floating window overlayed on top of another window, effectively helping users to multi-task better. The Facebook-owned instant messaging platform is reportedly working on other features like a group calling button for Android.